We've been trying unsucessfully to get in touch with Dr. A.W. since the middle of last week to get the results of Julia's blood work from 2 weeks ago. She has not answered our email, as she always has in the past. Today, we called and left a couple of voice mail messages, hoping she would get back with us. We'll give those messages a couple of days. It was a very sad day in our house today. 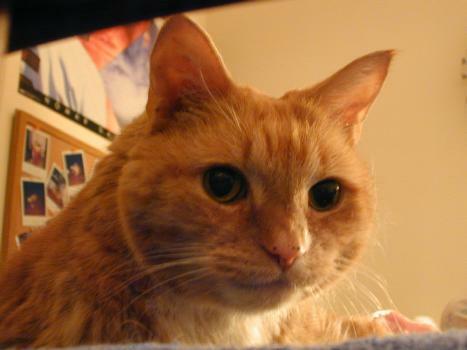 After several agonizing months, we finally decided to put our beloved 18-year-old cat, Larry, to sleep. Some history is in order. We (Julia's parents) got Larry in 1984, a couple of days after we moved into our first house. She (not a typo - Larry was a female) was the cutest, butterscotch tabby kitten you can imagine. She was playful and fun, and she was "our baby", at least until Julia came along in 1991. We spoiled her terribly, letting her sleep pretty much wherever she wanted and giving her the run of our house. Larry was not a happy camper when Julia came along. The first time Julia cried, Larry got a wide-eyed look that seemed to say "What have you brought into MY house?!? ", then ran and hid. But that was all - Larry never hissed at Julia or tried to bite her, and Julia was taught early on to treat Larry with respect. They always got along famously once Julia was about toddler age. Julia really loved Larry, and her favorite place to sleep was at the foot of Julia's bed. Starting about 6 months ago, Larry started acting weird. She started to urinate on the floor next to her litter box instead of in it. She lost weight, and started having increasing trouble getting up and down the stairs in our house. She also began acting different, not being so friendly and cuddly any more, and also she was craving water, yowling for it whenever her bowl got empty, which was almost every day. We took her to the vet, who diagnosed her with Feline Chronic Renal Failure. Blood tests confirned this diagnosis. There is no curing fCRF, just treatment that will slow the eventual, inevitable decline. We put Larry on prescription food to help with her kidney function, and it did seem to help for a while. Still, Larry seemed increasingly to be in pain. It became harder and harder for her to walk around the house, and she was no longer even able to stand steady - she would sway around in place. She seemed to walk gingerly and often displayed a limp. She would moan, as if she was in pain, and it's been many weeks at least since anyone has heard her purring, which she used to do all the time. Se seemed miserable all the time now. It was so sad to see Larry this way - she's always been so fun and vibrant and happy. Finally, over the weekend, Larry had an episode where she vomited and had diarrhea all over the basement floor. She was lying in it, and was making no effort to move. She had a pained look on her face all the time now. We agonized, and finally decided that Larry's quality of life was gone, and actually had been for the past couple of months. We called the vet and made an appointment to euthanize our Larry. It was scheduled for late afternoon today, and I went straight to the vet's from work. Julia and her mom were already there waiting for me. When I arrived, a woman was coming out of the vet's with a baby, and said to me, "Are you Larry's daddy?" I said yes, and she was crying a little when she said, "I'm so sorry. We'll say a prayer for you." I thanked her and went inside. Julia was holding Larry in a towel and quietly sobbing. Her mom wasn't a whole lot better off. We took Larry into an exam room where they weighed her. Then the vet came in and we gave him the quick version of Larry's story. He quickly agreed that this was the right decision. He gave us several minutes to pet and comfort Larry, but she seemed so miserable, so pathetic. The kitty we'd known and loved had left us a long time ago already, and it was time to say goodbye. The vet put a tourniquet around Larry's right front paw, and shaved a patch of her leg. Larry hates to be held down and was struggling a little, but she was so weak that it was a very feeble effort. He prepared a syringe, found a vein in her leg, injected a pink solution, and released the tourniquet. Immediately, Larry relaxed and lay her head down on the stainless steel table. In just a couple of seconds, she was still. The vet checked her with a stethoscope, and said, "She's gone." It was obviously completely painless for Larry; it was just like she went to sleep. So peaceful. Julia and her mom were sobbing again, and it was all I could do to keep from joining them. We stayed with Larry for a couple more minutes, saying our final goodbyes. We paid the vet staff for the procedure, and went home. We talked about getting a kitten, and soon, which will be a lot of fun. But during our evening, we also remembered some of the fun and happy memories we had with Larry. She was very much a member of our family, and we will miss her. I had always known Larry. She had been there ever since I could remember. I've played with her, talked to her, and loved her. Every night before I went to bed, I would talk to her a bit. But now, these past few days, I haven't had her to talk to, and she hasn't been sitting on my bed, and I don't know what I'm going to do without her. But now, I will tell you about Larry's last days, and how I felt about it. About five months ago, Larry had been doing OK, but she started yowling for no reason, and she kept missing the litter box when she went to the bathroom. She had been drinking her water a lot more. Then in January, she seemed very tired and sick and could barely get out of bed. We brought her to the doctors for an appointment, and the doctor took some blood tests. They came in a few days later and said that she had kidney failure. But, strangely by then, she seemed much better, and had some of her strength back. It was almost as if she had a virus or a cold. We started her on some new food that would slow down the process and she ate it, which we were surprised at, because she was always a very picky eater. Then, starting last month, everything came crashing down. Larry lost almost all her strength and could barely get up and down the stairs. Then, one day, we came home and found her lying in her vomit on the floor, and she hadn't even tried to get up out of it. She had completely lost her quality of life, so we decided to put her to sleep. My mom and I brought Larry to the doctors and we waited for Dad. When he got there, we went into the exam room. The doctor came in and shaved a small area of her leg and they injected a pink liquid into her vien. It was as if she instantly went to sleep. Her tounge fell out and I really started crying hard. Then the doctor said, "She's gone." We stayed with her for a while, and said how we loved her. After a while we left. I felt and feel like there's this big hole there where Larry was. I was very sad and I felt like I would never be happy again. But I'm slowly getting over it. I try to remember the happy times we had together, and I'll never forget how much I love her. Even if I get new cats and I move on, I'll never forget my Larry. In the middle of this afternoon, I was given 3 tickets to the Pawtucket (RI) Red Sox game for tonight. They were given to me from a co-worker, who has season tickets. We had to scramble a bit and rearrange some plans, but decided to take advantage of the opportunity and go! The game started at 6:00, so we had to leave work a bit early and drive through rush-hour traffic to get there on time. However, getting into McCoy Stadium is relatively easy and the parking is free. These seats are awesome! They are right behind the visitor's dugout, in the second row. I'd estimate that we are less than 100 feet from home plate, about the same distance from home to first base. The view is unobstructed by a screen, which is good, but required paying attention to every pitch, as foul balls can come right at us, and quickly. The ballpark, which is beautiful, was only about one-third full, which made traffic and lines all but non-existent. Julia was very excited to be here, and was thrilled by the quality of the seats. They do a good job of entertaining the fans between innings, with lively music, trivia, a roving minicam that displays fans on the scoreboard, and other fun stuff. It was a good game, too. The PawSox pitchers did a good job, and shut out the Indianapolis Indians 3-0. 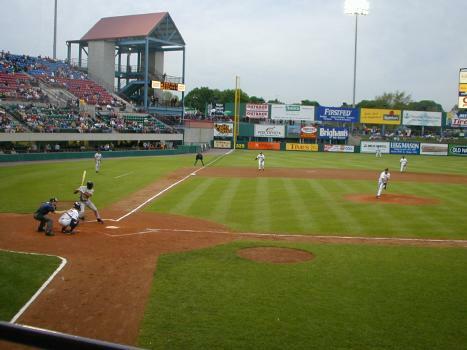 A couple of the PawSox hit home runs, and the team played good basic baseball. Julia was also pleased that the team won the game, even if they are not her Boston Red Sox. The game ended early, at 8:30, and then browsed in the store for a few minutes (I picked up a bargain Red Sox jersey, and Julia got a PawSox pin for her Red Sox hat). Traffic was not an issue going home, so we pulled into our driveway by 9:30. Julia had falled asleep on the way home. When we got home, there was an email waiting for us from Dr. A.W. It turns out she had a personal matter to deal with and was away from Boston longer than expected. We can certainly understand that. The news her email brought was not great. Julia's numbers from 2 weeks ago are: CK 143, Aldolase 5.9, AST 49, ALT 15, LDH 466, vonWillibrand's factor 115, WBC 6.1, Hematocrit 36.1, and Platelets 409. What is worrisome to us is the unexpected jump in LDH and AST, and the CK now being in the high-normal range. Dr. A.W. said that because Julia is feeling well and has normal strength on exam, we don't need to do anything differently at this point. We will wait and see what they are next time, which is in about 2 weeks. Dr. S. is in agreement that they just need to be rechecked. It may just be a fluke. Julia's mom was very concerned about this, and sent Dr. A.W. an email late in the evening. She wants some reassurance that we are not headed into a relapse situation. We want to have a better idea what else might be causing this bump in the road for us. We had been very optimistic until now, and we know intellectually that Julia's clinical condition is the most important thing, but it's still hard not to worry. We were talking through Julia's latest batch of numbers, and decided that they don't make sense. Every time the JDMS has shown increased activity in the past, there was always a pattern of increased rash and some sign of tireness and fatigue. That is absolutely not happenig this time. Julia's rash still looks perfect, and she has not stamina issues at all. In fact, today Julia has a 2.5 hour dance lesson, and after she got home she was practicing cartwheels in the family room. This kid is not having a flare, IMO. So an idea came to us today. The elevated numbers are LDH and AST, both liver indicators. What is the liver's primary basic function? To help filter impurities from the bloodstream. Why is this notable? Because Julia's bedroom and bathroom were painted the Saturday before her blood work last month, and she was exposed to the paint fumes for those few days. By "exposed," I mean "saturated" because the days they were in her room painting, the fumes were very strong, even with the windows open and the fans blowing. We suspect that the drying paint fumes were being inhaled by all of us. Paint gives off VOCs (Volatile Organic Compounds) as it dries, and once inhaled, make their way into the bloodstream. They are filtered, at least in part, by the liver. Also, Julia has not been very faithful to taking her morning vitamins since she stopped taking prescription medication in March, vitamins that include anti-oxidants like Vitamin C. All this, we theorize, may have contributed to these lab results. We're going to run this past the doctors via email and see what they have to say. We're also going wait until later in the month to have Julia retested to give her body more time to clear this stuff from her system. Say a prayer, faithful readers. "May your tears be turned into dancing"
Some friends told us they had seen a posting at their vet's office that there were free kittens available from 2 families. We decided to visit one and see if we could get one. We went to the first place, a small second-floor apartment is a kind of run-down section a a small city. This family had 3 adult cats, and 2 litters of kittens, 3 that were 7 weeks old (born 3/20) and about 4 that were just 3 weeks old. 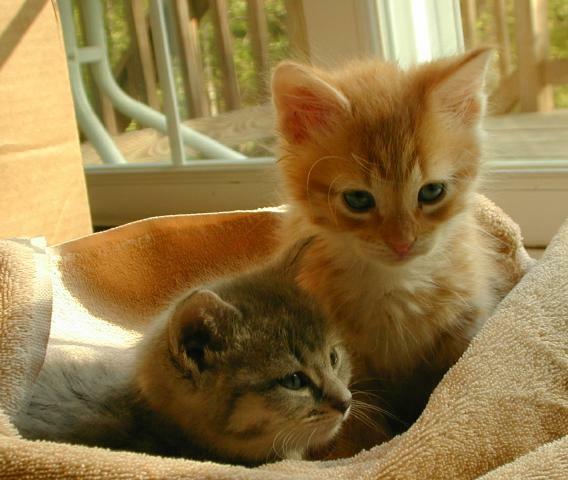 We looked at the 7-week-old kittens, a calico female, and three orange males. One of the orange males took an immediately liking to me, walking right over and being very affectionate. The other three were very aloof and did not seem to like any of us, especially the calico female. Even though we had hoped to get one or possibly two females, we ended up taking the orange male home. On the ride home, we talked and talked about a name for our new kitty, and debated whether to look at the other litter of kittens we'd heard about. We decided to have a look at the other litter, and tried to call several times, but no one was home until we were nearly home. We settled our new kitty into the house, then headed out to check out the other litter. The second family was a big-time cat loving group. They had 3 adult cats, and a litter of 4 not-quite 6 week olds (born April 1). They had an orange tabby male, a calico female that they were keeping, a black-and-white male, and a gray female. All three of us fell in love with the gray female immediately, although the calico female, which was not available to us, was just as lovable. We quickly decided to take the plunge and get our second kitten! We thanked the family and headed home to unite our new "kids". It was almost an hour ride home, and the naming debate raged almost the whole way. We wanted to name our kittens as a couple, it was just too tempting not to! A thousand ideas were thrown out and debated, most being immediately rejected as unacceptable to one or more of us. Finally, just a few minutes from home, we all agreed on "Romeo" and "Juliet"! The names fit out kitties, they were a couple, and even though it wasn't anyone's first choice, it was a set of names we all liked and could live with. These little guys are very cute! We introduced them to each other and they seemed to hit it off very well. We gave each of them a quick bath in the bathroom sink, and gave them some kitten food and milk. They seem to be acclimating very well! We got an email from Dr. A.W. late yesterday. She said that the hard part about a lot of labs is that they are not specific. In the case of the AST and LDH, they can come from liver, but they can come from muscle as well. That's why they're part of the JDMS panel that we follow. She thinks that our theory about paint fumes is certainly as good as any they could come up with, but there's just no way to know for sure. She agreed that these lab results are somewhat incongruous with Julia's current strength and stamina. If she were symptomatic, we might have made some intervention based on these numbers rather than just waiting to recheck them. She offered that we could do the next set of labs at 3 weeks instead of waiting for the usual 4 weeks. Maybe we'll see if we can find a time to test Julia again next week. Given Dr. A.W. 's comments and the general high anxiety level around our house, we rearranged things and took Julia in to Boston for blood work this morning. Julia and her mom headed into Boston's rush hour traffic and got in and out of Children's Hospital pretty smoothly, if somewhat slowly. We emailed Dr. A.W. and awaited the results. The email arrived early in the evening, and the news is great! The raw results are: CK 86, LDH 197, AST 25, ALT 20, ESR 9, White blood cells 4.55, Hematocrit 37.4, and Platelets 379. We're still waiting on Aldolase and vonWillibrand's factor, aut all these numbers are right back where they should be! Dr. A.W. said that she thinks these look great, and certainly seem more reflective of how she is doing. We are all very relieved, and perhaps vindicated that our paint fumes theory may be right. Dr. A.W. dropped us a quick email to let us know that Aldolase was a nice, normal 5.3. We will probably get vWF8 early-to-mid next week. Today is Julia's annual Dance Recital. She's been so looking forward to this - she's been practicing very hard! She even had me burn her a CD with all her dance songs on it so she could practice. So you know, Julia's dance school holds 2 recitals, each running about two-and-a-half hours, one in the early afternoon (1:30PM) and the other in the late afternoon/early evening (5:00PM). It makes for a long and tiring, but satisfying, day for her. The morning was spent running various errands, including Julia's regular weekly keyboard lesson. This was something of a pain since it was raining hard all morning. In the late morning, my parents and my wife's father and aunt arrived to visit and to attend the recital. We chatted for a while and had lunch until Julia had to get dressed to go to the early performance. Julia's part in both shows was identical - a tap number, a ballet number, 2 jazz numbers, and the finale. That's not to say that both shows are the same - they are not. There are various solo and duet dances that are only done once, at one show or the other. Also, the littlest ones (3-4 years old) are at the early show only, and the next oldest group is only in the later show. For once, I attended both shows because it just happened to work out that way. A friend of Julia's from school was in attendance for the second show. I had to leave the first show, go pick up Julia's friend, go get the flowers for Julia at home, and then make it back to the show site. Julia's friend had never been to a dance recital, and was looking forward to it. Julia performed excellently. From the vantage point of our third-row center seats, Julia knew every step, hit every mark, and looked great doing it! She was smiling and obviously enjoying herself throughout both shows. She danced with style and grace that I didn't even know she had! She performed as well as any of the other dancers up there. It was a great source of pride for me as a parent, but also sense of relief and thankfulness that she is actually able to do this. She has been dancing throughout the past 4 years of dealing with JDMS, but I think she did it with absolutely no compromises this year. After the show, we went home so Julia could change clothes, then went out to dinner. We got home very late (for us!) and everyone was to wired to go to sleep. Everyone played with the kittens for a while before getting to bed. Another crazy day! Julia had children's choir practice right before they sang at Mass. Then we headed out to drop off Julia's friend, then went home to change clothes. We spent the rest of the day at a celebration of the 25th anniversary of the ordination of a Priest friend of ours. The afternoon started out with another Mass, this one led by our priest friend. The mass was filled with beautiful visuals and music, as this priest is a big fan of opera music. We met with a lot of friends there, and it was almost like a reunion. After Mass, there was a reception in the basement of the church. In contrast to yesterday, this was a beautiful day and some of the festivities spilled outdoors. After the reception, there was a dinner in a reception hall. After dinner, there was sharing of gifts of story, and music. People rewrote song lyrics to honor him. There were some funny and touching moments. All this ran rather late, and Julia realized that she had some homework to complete! Like last night, we were all wide awake when we got home, but Julia was also exhausted from not getting enough sleep last night. She finished her homework and headed off to bed. What a weekend we had!